Spend some solo time on your private balcony with a book, or gather your whole crew for late-night snacks. The fitness center makes it ultra-convenient to get a workout in. Hit the 18-hole championship golf course onsite before trying the other local favorites. Somehow it just feels more like home with a few kids' toys, water wings and goggles scattered about. The area’s two tallest towers, Ariel Dunes is tucked within the Seascape Golf and Tennis Resort, treating you to breathtaking views of the Gulf of Mexico and Choctawhatchee Bay. 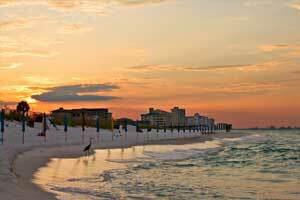 Ariel Dunes I faces south, directly toward the beach, and Ariel Dunes II faces southwest overlooking the stunning coastline for spectacular sunsets and twinkling night views of Destin. Glassed-in elevator lobbies give you a peek at the greater Seascape resort. Outside, you have easy access to a glorious 2,0000-foot stretch of sugar white sand for the beach fans in your crew. That said, the property is dotted with multiple pools, for a grand total of 24,000 square feet across all five. Wave in your mini-splashers midday and head to the Cabana Café on the first floor of Ariel Dunes I, open for breakfast, lunch, dinner and even late-night eats. Stop back later and pull up a stool at the full service bar with views out over the pool deck, plus live music and daily specials. Plan for some you-time at the fitness center or on one of the eight tennis courts, then swing by the steam bath or sauna before heading back to your condo to map out a plan for dinner (which may default to take-out, depending on what’s left in the fridge). When the kids have had enough of the mushroom fountain in the zero-entry pool, gather up your pool gear and walk back to your condo to get everyone presentable for dinner. (There may even be time for a short snooze.) One- to three-bedroom condos all have fully equipped kitchens with granite countertops, plus nine-foot ceilings and separate living/dining areas. Your private balcony means you’re just a sliding glass door away from the tropical Florida breeze, day or night – the perfect spot for a book and glass of wine. In addition to the water sports rentals at the beach, there’s an 18-hole championship golf course and pro shop right onsite. Plus you’re minutes from great restaurants and more golf. Shopper alert: you’re just five miles from Destin Commons, voted “Best Place to Shop” by local readers of Emerald Coast Magazine. And Silver Sands, the largest factory outlet mall in the country, is less than a mile away. - Front desk is open 9:00 AM-5:00 PM daily. Check-in for this property is based at 11125 US Hwy 98 W, Miramar Beach, FL, 32550, and must be completed prior to going to the rental property. Guests planning to arrive outside front desk hours must use the after-hours lobby phone to obtain a lock-box code. Guests must return to the office the next day by noon to complete check-in. For more details, please contact the office using the information on the reservation confirmation received after booking.